Following November’s sell-out launch at London’s P21 Gallery, celebrations of the new bilingual anthology A Blade of Grass: New Palestinian Poetry (Smokestack Books) continue. The first review has appeared – and is glowing! – while February saw editor Naomi Foyle in discussion with Sarah Irving, editor of the landmark Scottish-Palestinian anthology A Bird is Not a Stone (Freight Books, 2015), an event chaired by Farah Aridi for Hibr: A Festival of Arab Poetry (Goldsmiths English PEN). Next up is a launch at Chichester University, where on Monday March 12th poet Mustafa Abu Sneineh and translator Waleed Al-Bazoon will join Naomi Foyle, also a Senior Lecturer at the University, for a reading of poems and translations from the book, followed by discussion and Q&A. Should a trip to Chichester seem a daunting prospect, rest assured that the book can be ordered at any UK bookshop, or direct from the publisher. 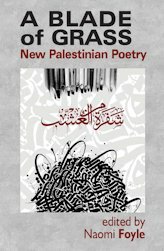 A Blade of Grass: New Palestinian Poetry brings together, in English and Arabic, new work by poets from the Palestinian territories, from the diaspora, and from within the disputed borders of Israel. Presenting work by Marwan Makhoul, Maya Abu Al-Hayyat, Fatena Al-Ghorra, Dareen Tatour, Ashraf Fayadh, Fady Joudah, Naomi Shihab Nye, Deema K. Shehabi, Mustafa Abu Sneineh, Farid Bitar, Sara Saleh and Mahmoud Darwish, and featuring an introduction by the book’s editor, poet and activist Naomi Foyle, the anthology celebrates the flourishing cultural resistance of the Palestinian people to decades of displacement, occupation, exile and bombardment. Voices fresh and seasoned converse with history, sing to the land, and courageously nurture an attachment to human fragility. Written in free verse and innovative forms, hip hop rhythms and the Arabic lyric tradition, these poems bear witness both to catastrophe, and to the powerful determination to survive it. Smokestack Books is a small independent press based in Yorkshire. Smokestack champions poets who are unfashionable, radical, left-field and working a long way from the metropolitan centres of cultural authority. Smokestack is interested in the World as well as the Word; believes that poetry is a part of and not apart from society; argues that if poetry does not belong to everyone it is not poetry. A Blade of Grass: New Palestinian Poetry was part-funded by a University of Chichester Research Development Award, granted to the editor. A portion of proceeds from the book will be donated toward the legal fees of Ashraf Fayadh and Dareen Tatour, both currently imprisoned, respectively in Saudi Arabia and Israel, on charges related to their poetry. Mustafa Abu Sneineh is a poet and writer from Jerusalem. His first poetry collection A Black Cloud at The End of The Line was published in 2016. He holds a degree in Law from Birzeit University, Palestine and an MA in Postcolonial Studies from Goldsmiths College, London. Waleed Al-Bazoon is a Senior Lecturer in English Literature at the University of Basra in Iraq. He holds a PhD in Contemporary Fiction from the University of Chichester, where he has taught in the Department of English and Creative Writing, and is currently a Fellow. His poetry collection The War on Idigna appeared in 2011. Naomi Foyle is an award-winning poet, novelist, verse dramatist, and essayist. Her books include The Night Pavilion, an Autumn 2008 Poetry Book Society Recommendation, and The Gaia Chronicles, a science fantasy quartet. In 2017 she co-translated the poetry collection Wounds of the Cloud by Yasser Khanger (Al Ma’mal Foundation, Jerusalem). BWISP is getting excited! 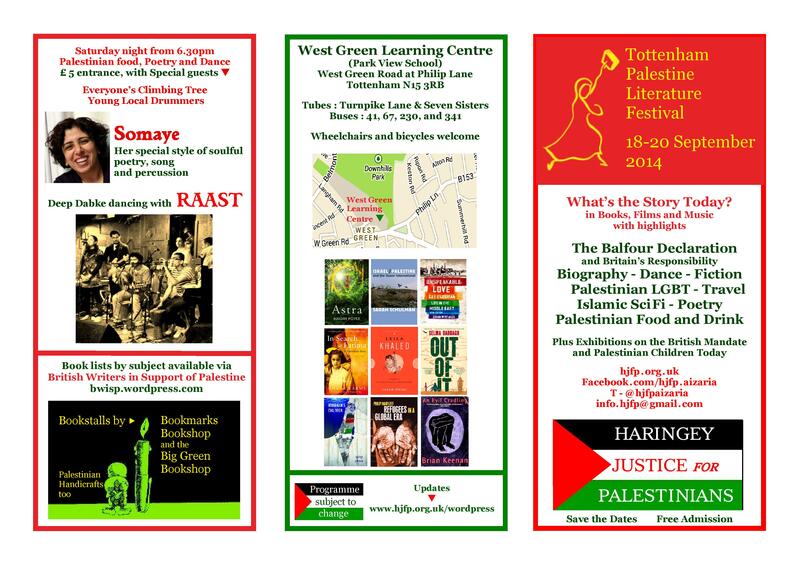 Sept 18-20 is the second Tottenham Palestine Literature Festival, organised by Haringey Justice for Palestine. A free weekend of literature, politics, music and Palestinian food, held at the West Green Learning Centre, the festival features an international cast including Ghada Karmi, Selma Dabbagh, Baroness Jenny Tonge, Ruqayyah Kareem, Brian Whitaker, Dervla Murphy, Sarah Irving, Naomi Foyle and Sarah Schulman. Guests will be exploring a wide range topics including Biography, Fiction, Poetry, Travel, Middle Eastern SF, LGBT in the Occupied Territories, and – you can’t discuss Palestine in the UK without it – the Balfour Declaration. 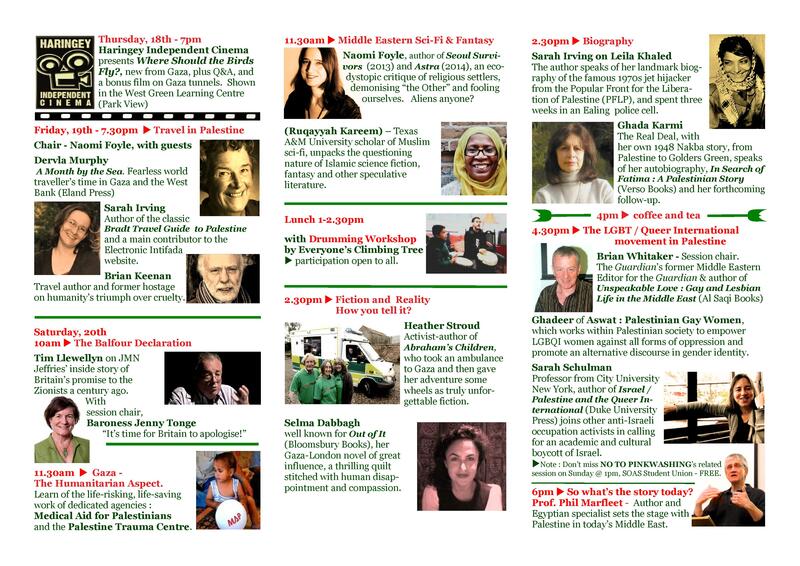 The full programme is below, or here on the HJfP website. Directions here – if you’re in London, hope to see you there!